This past weekend was my birthday, and I celebrated with one of my favorite things - pizza! There is truly nothing better than a good slice. We went to Pizza Beach and had a variety of pizzas including one that had avocado on it. So delicious! The best part was that I was in bed by midnight. I truly do feel like I'm getting old. On Saturday my parents came down for the day and we went down to the World Trade Center, to Chelsea Market, and the West Village. It was one of the first cold days in New York and was nice to spend it outdoors. I visited Seed and Mill in Chelsea Market for the first time and brought home some of their delicious halva. I've been loving baking with tahini lately so I can't wait to incorporate halva into a recipe soon! A couple weeks ago, Feed Feed and Vitamix reached out to me to test the new Vitamix Explorian Machine and the Vitamix Winter Spice Mix! Once I found out exactly which spices were in the Winter Spice Mix (pink peppercorn, cinnamon, candied ginger, orange peel, cardamom, and more goodness!) 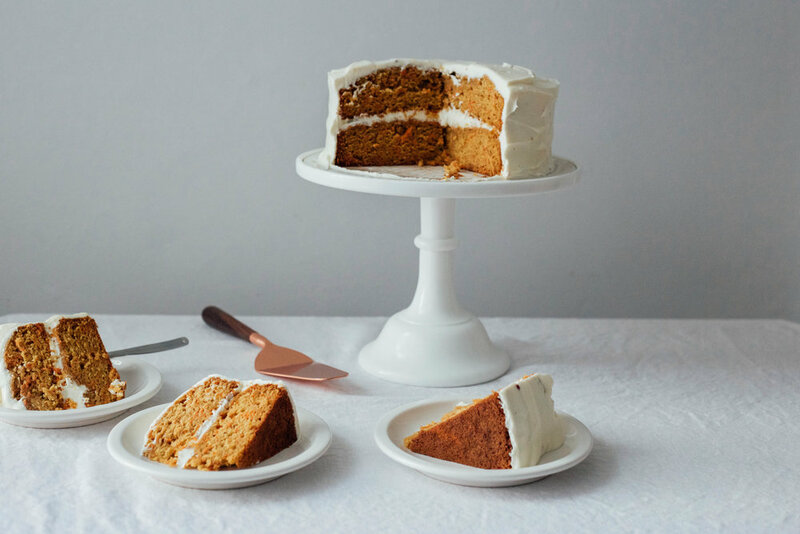 I knew I had to make a carrot cake. 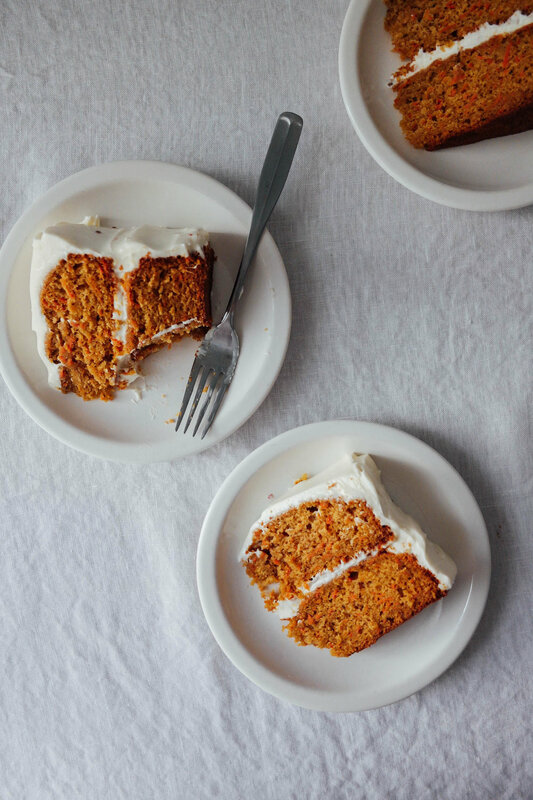 It's a recipe that's been a longtime favorite for my family - my parents had a carrot cake at their wedding! Vitamix sent the Winter Spice Mix in both forms - both ground and whole - and I decided to test out grinding it myself in the machine. It worked like a charm and I was able to easily incorporate it into the carrot cake batter, which I also made in the Vitamix! The results were perfection - super smooth and moist cake, with a slightly sweet frosting with a hint of pink peppercorn. Along with the Vitamix, I was also invited to a brunch at The Feed Feed's new Brooklyn space, with about twenty other people who had all made recipes using the Winter Spice Mix in the Vitamix! The space was gorgeous - spacious with tons of beautiful natural light - and everyone's recipes were incredible. Seeing everything from roasted vegetables with sauces, to protein bites, even to ravioli, really opened my eyes to how versatile the Vitamix and Winter Spice Mix is! I can't wait to see everyone else's recipe and try some for myself. Grease and flour two 8 inch round baking pans and set aside. Pour the Winter Spice Mix into the vitamix and begin to blend, beginning at the lowest setting and working your way up to the highest setting until a fine powder is formed. Transfer ground spice mixture into a small container and set aside. In the Vitamix mix together oil, granulated sugar, and brown sugar until combined and smooth on the first setting. Add in the eggs one at a time, then the vanilla, and mix until smooth. In a separate bowl, whisk together the remaining dry ingredients (flour, cinnamon, baking soda, salt, baking powder, and Vitamix Winter Spice Mix) until combined. Add the dry ingredient mixture to the Vitamix and begin mixing, beginning on the first setting, working your way up to the fourth setting. Scrape down the sides to make sure everything is combined. Pour mixture into a large bowl and fold in the grated carrots by hand, and stir until combined. Pour the batter evenly into the prepared cake pans. Then bake for 30-25 minutes or until a knife inserted in the middle of the cakes comes out clean. Remove pans and let them cool on a wire rack until the cakes reach room temperature. Make the cream cheese frosting by combining cream cheese, butter, confectioners sugar, and salt with a wooden spoon until smooth. Fold in crushed pink peppercorn. Layer the cakes with the cream cheese frosting, and then frost the outside of the cake as you desire. See the video below if you need an example! This post was sponsored by Vitamix and The Feed Feed.